Partial Bible translations into languages of the English people can be traced back to the late 7th century, including translations into Old and Middle English. More than 450 translations into English have been written. The New Revised Standard Version is the version most commonly preferred by biblical scholars. In the United States, 55% of survey respondents who read the Bible reported using the King James Version in 2014, followed by 19% for the New International Version, with other versions used by fewer than 10%. Although John Wycliffe is often credited with the first translation of the Bible into English, there were in fact many translations of large parts of the Bible centuries before Wycliffe's work. Parts of the Bible were first translated from the Latin Vulgate into Old English by a few select monks and scholars. Such translations were generally in the form of prose or as interlinear glosses (literal translations above the Latin words). Very few complete translations existed during that time. Most of the books of the Bible existed separately and were read as individual texts. Thus the sense of the Bible as history that often exists today did not exist at that time. Instead, an allegorical rendering of the Bible was more common and translations of the Bible often included the writer’s own commentary on passages in addition to the literal translation. Toward the end of the 7th century, the Venerable Bede began a translation of scripture into Old English. Aldhelm (c. 639–709) translated the complete Book of Psalms and large portions of other scriptures into Old English. In the 10th century an Old English translation of the Gospels was made in the Lindisfarne Gospels: a word-for-word gloss inserted between the lines of the Latin text by Aldred, Provost of Chester-le-Street. This is the oldest extant translation of the Gospels into the English language. The Wessex Gospels (also known as the West-Saxon Gospels) are a full translation of the four gospels into a West Saxon dialect of Old English. Produced in approximately 990, they are the first translation of all four gospels into English without the Latin text. In the 11th century, Abbot Ælfric translated much of the Old Testament into Old English. The Old English Hexateuch is an illuminated manuscript of the first six books of the Old Testament (the Hexateuch). Another copy of that text, without lavish illustrations but including a translation of the Book of Judges (hence also called the Old English Heptateuch), is found in Oxford, Bodleian Library, Laud Misc. 509. The Ormulum is in Middle English of the 12th century. Like its Old English precursor from Ælfric, an Abbot of Eynsham, it includes very little Biblical text, and focuses more on personal commentary. This style was adopted by many of the original English translators. For example, the story of the Wedding at Cana is almost 800 lines long, but fewer than 40 lines are the actual translation of the text. An unusual characteristic is that the translation mimics Latin verse, and so is similar to the better known and appreciated 14th-century English poem, Cursor Mundi. Richard Rolle (1290–1349) wrote an English Psalter. Many religious works are attributed to Rolle, but it has been questioned how many are genuinely from his hand. Many of his works were concerned with personal devotion, and some were used by the Lollards. The 14th century theologian John Wycliffe is credited with translating what is now known as Wycliffe's Bible, though it is not clear how much of the translation he himself did. This translation came out in two different versions. The earlier text is characterised by a strong adherence to the word order of Latin, and might have been difficult for the layperson to comprehend. The later text made more concessions to the native grammar of English. Early Modern English Bible translations are of between about 1500 and 1800, the period of Early Modern English. This, the first major period of Bible translation into the English language, began with the introduction of the Tyndale Bible. The first complete edition of his New Testament was in 1526. William Tyndale used the Greek and Hebrew texts of the New Testament (NT) and Old Testament (OT) in addition to Jerome's Latin translation. 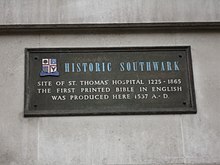 He was the first translator to use the printing press – this enabled the distribution of several thousand copies of his New Testament translation throughout England. Tyndale did not complete his Old Testament translation. The first printed English translation of the whole bible was produced by Miles Coverdale in 1535, using Tyndale's work together with his own translations from the Latin Vulgate or German text. After much scholarly debate it is concluded that this was printed in Antwerp and the colophon gives the date as 4 October 1535. This first edition was adapted by Coverdale for his first "authorised version", known as the Great Bible, of 1539. Other early printed versions were the Geneva Bible (1560), notable for being the first Bible divided into verses and which negated the Divine Right of Kings; the Bishop's Bible (1568), which was an attempt by Elizabeth I to create a new authorised version; and the Authorized King James Version of 1611. The first complete Roman Catholic Bible in English was the Douay–Rheims Bible, of which the New Testament portion was published in Rheims in 1582 and the Old Testament somewhat later in Douay in Gallicant Flanders. The Old Testament was completed by the time the New Testament was published, but due to extenuating circumstances and financial issues was not published until nearly three decades later, in two editions, the first released in 1609, and the rest of the OT in 1610. In this version, the seven deuterocanonical books are mingled with the other books, rather than kept separate in an appendix. While early English Bibles were generally based on a small number of Greek texts, or on Latin translations, modern English translations of the Bible are based on a wider variety of manuscripts in the original languages (Greek and Hebrew). The translators put much scholarly effort into cross-checking the various sources such as the Septuagint, Textus Receptus, and Masoretic Text. Relatively recent discoveries such as the Dead Sea scrolls provide additional reference information. There is some controversy over which texts should be used as a basis for translation, as some of the alternate sources do not include phrases (or sometimes entire verses) which are found only in the Textus Receptus. Some say the alternate sources were poorly representative of the texts used in their time, whereas others claim the Textus Receptus includes passages that were added to the alternate texts improperly. These controversial passages are not the basis for disputed issues of doctrine, but tend to be additional stories or snippets of phrases. Many modern English translations, such as the New International Version, contain limited text notes indicating where differences occur in original sources. A somewhat greater number of textual differences are noted in the New King James Bible, indicating hundreds of New Testament differences between the Nestle-Aland, the Textus Receptus, and the Hodges edition of the Majority Text. The differences in the Old Testament are less well documented, but do contain some references to differences between consonantal interpretations in the Masoretic Text, the Dead Sea Scrolls, and the Septuagint. Even with these hundreds of differences, however, a more complete listing is beyond the scope of most single volume Bibles (see Critical Translations below). Formal equivalence translation (sometimes literal translation or formal correspondence) in which the greatest effort is made to preserve the meaning of individual words and phrases in the original, with relatively less regard for its understandability by modern readers. Dynamic equivalence, sometimes called Paraphrastic translation, in which the translator attempts to render the sense and intent of the original. Examples include , The Living Bible and The Message. Some translations have been motivated by a strong theological distinctive, such as the conviction that God's name be preserved in a Semitic form, seen in Sacred Name Bibles. The Purified Translation of the Bible promotes the idea that Jesus and early Christians did not drink wine, but grape juice. The Jehovah's Witnesses' New World Translation of the Holy Scriptures renders the tetragrammaton as Jehovah throughout the Old Testament; it also uses the form Jehovah in the New Testament, including but not limited to passages quoting the Old Testament, even though it does not appear in the Greek text. While most translations are made by committees of scholars in order to avoid bias or idiosyncrasy, translations are sometimes made by individuals. The translation of J.B. Phillips (1958), The Bible in Living English (1972) by Stephen T. Byington, J.N. Darby's Darby Bible (1890), Heinz Cassirer's translation (1989), R.A. Knox (1950), Gerrit Verkuyl's Berkeley Version (1959), The Complete Jewish Bible (1998) by Dr. David H. Stern, Robert Young's Literal Translation (1862), Jay P.Green's Literal Translation (1985), The Emphatic Diaglott by Benjamin Wilson (1864), Noah Webster's Bible Translation (1833), The Original Aramaic Bible in Plain English (2010) by David Bauscher, American King James Version (1999) by Michael Engelbrite, The Living Bible (1971) by Kenneth N. Taylor, The Modern Reader's Bible (1914) by Richard Moulton, The Five Pauline Epistles, A New Translation (1900) by William Gunion Rutherford, Joseph Bryant Rotherham's Emphasized Bible (1902), Professor S. H. Hooke's The Bible in Basic English (1949), The Holy Name Bible containing the Holy Name Version of the Old and New Testaments (1963) by Angelo Traina, and Eugene H. Peterson's The Message (2002), and Father Nicholas King's translation of the Greek Bible into English, are largely the work of individual translators. Others, such as Robert Alter, N. T. Wright and Dele Ikeorha have translated portions of the Bible. In the beginning God (Elohim) created [by forming from nothing] the heavens and the earth. The earth was formless and void or a waste and emptiness, and darkness was upon the face of the deep [primeval ocean that covered the unformed earth]. The Spirit of God was moving (hovering, brooding) over the face of the waters. While most translations attempt to synthesize the various texts in the original languages, some translations also translate one specific textual source, generally for scholarly reasons. A single volume example for the Old Testament is The Dead Sea Scrolls Bible (ISBN 0-06-060064-0) by Martin Abegg, Peter Flint and Eugene Ulrich. The Comprehensive New Testament (ISBN 978-0-9778737-1-5) by T. E. Clontz and J. Clontz presents a scholarly view of the New Testament text by conforming to the Nestle-Aland 27th edition and extensively annotating the translation to fully explain different textual sources and possible alternative translations. A Comparative Psalter (ISBN 0-19-529760-1) edited by John Kohlenberger presents a comparative diglot translation of the Psalms of the Masoretic Text and the Septuagint, using the Revised Standard Version and the New English Translation of the Septuagint. R. A. Knox's Translation of the Vulgate into English is another example of a single source translation. Jewish English Bible translations are modern English Bible translations that include the books of the Hebrew Bible (Tanakh) according to the masoretic text, and according to the traditional division and order of Torah, Nevi'im, and Ketuvim. Jewish translations often also reflect traditional Jewish interpretations of the Bible, as opposed to the Christian understanding that is often reflected in non-Jewish translations. For example, Jewish translations translate עלמה ‘almâh in Isaiah 7:14 as young woman, while many Christian translations render the word as virgin. While modern biblical scholarship is similar for both Christians and Jews, there are distinctive features of Jewish translations, even those created by academic scholars. These include the avoidance of Christological interpretations, adherence to the Masoretic Text (at least in the main body of the text, as in the new Jewish Publication Society (JPS) translation) and greater use of classical Jewish exegesis. Some translations prefer names transliterated from the Hebrew, though the majority of Jewish translations use the Anglicized forms of biblical names. The first English Jewish translation of the Bible into English was by Isaac Leeser in the 19th century. The JPS produced two of the most popular Jewish translations, namely the JPS The Holy Scriptures of 1917 and the NJPS Tanakh (first printed in a single volume in 1985, second edition in 1999). Since the 1980s there have been multiple efforts among Orthodox publishers to produce translations that are not only Jewish, but also adhere to Orthodox norms. Among these are The Living Torah and Nach by Aryeh Kaplan and others, the Torah and other portions in an ongoing project by Everett Fox, and the ArtScroll Tanakh. Sales are affected by denomination and religious affiliation. For example, the most popular Jewish version would not compete with rankings of a larger audience. Sales data can be affected by the method of marketing. Some translations are directly marketed to particular denominations or local churches, and many Christian booksellers only offer Protestant Bibles, so books in other biblical canons (such as Catholic and Orthodox Bibles) may not appear as high on the CBA rank. ^ "The Bible in American Life" (PDF). Archived from the original (PDF) on 2014-05-30. Retrieved 2014-09-13. ^ a b c d e f Hall, M. Clement (2011). Murder of Richard Hunne London in the Early Reign of King Henry Viii. Lulu.com. pp. 60–61. ISBN 9781435791770. ^ a b Published on Friday 22 September 2006 16:47 (2006-09-22). "Let Gospels come home - All News". Sunderland Echo. Retrieved 2012-10-31. Herbermann, Charles, ed. (1913). "Richard Rolle de Hampole". Catholic Encyclopedia. New York: Robert Appleton Company. ^ a b c d Outlaw, D. W. (2011-07-12). God: Trail of Evidence: The Quest for the Truth. iUniverse. pp. 139–140. ISBN 9781450294300. ^ "King James Version | History & Background". Encyclopedia Britannica. Retrieved 2019-01-11. ^ "Douai-Reims Bible | Roman Catholic Bible". Encyclopedia Britannica. Retrieved 2019-01-11. ^ a b See the New International Version, the Revised Standard Version, The New King James Version and the New American Standard Version of the Bible. ^ "The New Testament: A Purified Translation". www.biblecollectors.org. Retrieved 2019-01-11. ^ "Genesis 1 AMP - In the beginning God (prepared, formed". Bible Gateway. Retrieved 2012-10-31. ^ Rice, Joyce (9 January 2009). "The Comprehensive New Testament" (Book review). Forewordreviews.com. Archived from the original on 2014-03-17. Retrieved 2012-10-31. ^ Haines, Alastair (17 October 2009). "The Comprehensive New Testament, Clontz, T. E. and J. Clontz, editors" (PDF) (Book review). Review of Biblical Literature. Retrieved 2012-10-31. ^ "CBA Best Sellers" (PDF). CBAonline.org. Feb 2013. Archived from the original (PDF) on 2012-07-14. Retrieved 2013-02-24. ^ Sarah Eekhoff Zylstra for Christianity Today. March 13, 2014 The Most Popular and Fastest Growing Bible Translation Isn't What You Think It Is: NIV vs. KJV: Surveys and searches suggest the translation that most Americans are reading is actually not the bookstore bestseller. Daniell, David (2003). The Bible in English: Its History and Influence. Yale University Press, 962. ISBN 0-300-09930-4. Fowler, David C. The Bible in Early English Literature. Seattle: University of Washington Press, 1976. Grabois, Aryeh. "Bible: Biblical Impact on Daily Life." Dictionary of the Middle Ages. Vol 2. Ed. Joseph R. Strayer. New York: Charles Scribner's Sons, 1983. Lawton, David. “Englishing the Bible, 1066-1549.” The Cambridge History of Medieval English Literature. Cambridge: Cambridge UP, 1999. 454-482. Levy, Bernard S. Preface. The Bible in the Middle Ages: Its Influence on Literature and Art. Ed. Bernard S. Levy. New York: Medieval & Renaissance Texts & Studies, 1992. Maas, A.J.. "Versions of the Bible: English Versions" The Catholic Encyclopedia. Vol 15. New York: Robert Appleton Company, 1912. Muir, Laurence. "Translations and Paraphrases of the Bible and Commentaries." A Manual of the Writings in Middle English: 1050-1500. Ed. J. Burke Severs. Connecticut: The Connecticut Academy of Arts and Sciences, 1970. Vol 2. 381-409. The New Testament Octapla: Eight English Versions of the New Testament, in the Tyndale-King James Tradition, ed. by Luther A. Weigle. New York: T. Nelson & Sons, . N.B. : The eight English translations of the entire N.T. included (on quarter portions of facing pages) are those of the Bibles in English known as Tyndale's, Great Bible, Geneva Bible, Bishops' Bible, Douay-Rheims (the original Rheims N.T. thereof being included), Great Bible, Authorized "King James", Revised Version, and Revised Standard Version. Nick Spencer, Freedom and Order: History, politics and the English Bible (London, Hodder & Stoughton, 2011). Taliaferro, Bradford B., Bible Version Encyclopedia (Lulu Enterprises, Inc. First Edition 2006-2007). Wikisource has the text of the 1911 Encyclopædia Britannica article Bible, English. A collection of links on the Gender-Neutral Bible Controversy, mainly from a perspective opposing Gender-Neutral translations. Darlow, T. H.; Moule, H. F. (1903). Historical Catalogue of Printed Editions of Holy Scripture (Vol. I, English editions). London: The Bible House. "Bible, Curious Editions of" . New International Encyclopedia. 1905.